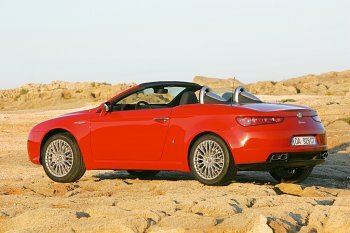 The new convertible, derived from the attractive Alfa Brera coupé, was developed by Pininfarina in conjunction with the Alfa Romeo Style Centre and will be assembled in Pininfarina's San Giorgio Canavese plant (Turin). A byword for sportiness, Italian flair and quality, the model is confirmed as a stylish and generously proportioned 2-seater. The Alfa Spider is 183 centimetres wide, 439 cm long and 131 cm high with a wheelbase of 253 cm, although the sharply tapered front and rear make it look more compact. Despite this, we have not had to stoop to compromise by choosing between comfort and function, as you are often forced to do with this type of car. The luggage compartment offers 253 dm3 (always available whether the hood is up or down) while there are numerous roomy oddments recesses (including the climatised one in the central console). 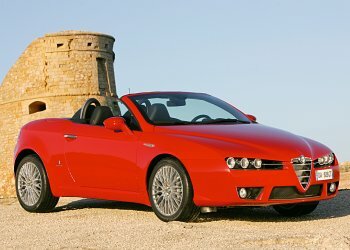 In detail, the new Alfa Spider offers an up-to-date appealing front end, similar to that of the coupé on which it is based, with a shield occupying pride of place in the centre, the starting point of the lines that run along the bonnet and frame the headlights, ‘suspended’ on an air inlet: a stylistic and functional device that Alfa Romeo reserves for its out-and-out sports cars, which makes the front look even wider and more imposing, because the shoulder of the wing and the front pillar are stronger and thicker. From the side, the combination of a short wheelbase, long bonnet and compact, rear-mounted cabin enhances the car’s sporty, dynamic looks. This impression of great temperament is underlined by the elongated rear lights and four exhaust terminals. But the styling of the new Spider also includes some ‘romantic’ elements, in the best Alfa Romeo tradition, such as the fold-away, light hood, and the design of the rear shoulder muscle that is borrowed directly from the famous Giulietta Spider. The collaboration between the Alfa Romeo style centre and Pininfarina continues inside the vehicle where a sporty look has been achieved by the general layout and one-off features such as the armrest area of the door panel or the band that wraps around the surface above the rear bench. Without mentioning that the dash features an array of controls and instruments that all face the driver. The seats, while maintaining an area with distinctive Alfa piping, have been customised by incorporating the head-restraints into the structure and by side strips that connect the 4-point seat-belts and give a personality boost to the seat. And finally, the Alfa Romeo soft top, an irresistible design feature, is distinctive for its light appearance and the way it blends in perfectly with the rest of the car. For example, the U-shaped hood cover fits in harmoniously with the body and houses a third brake light in its base. Last but not least, the rear roll-bar is a safety element that slots perfectly into the silhouette of the car which tracks the line of the seat to shade off into the rear volume above the rigid hood cover. And everything is embellished by the two ‘bosses’ set behind the roll-bar and enriched by some high-tech details. Sportiness and elegance combined in unique, exclusive styling. Harmonious forms and volumes which produce a beautiful, powerful, solid car, when they are supported by Alfa Romeo mechanical and engineering excellence. All this without ever stooping to compromise in terms of comfort and on-board wellbeing.